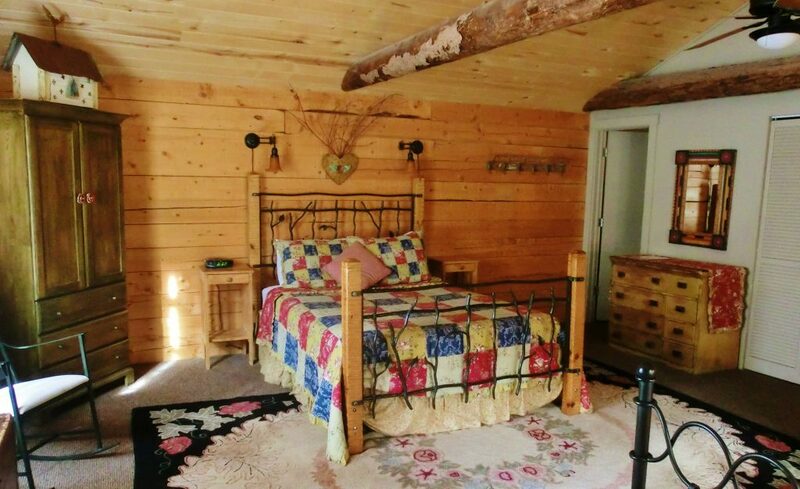 The Creekside cabin is a charming and cozy, log cabin with a full kitchen and bath. It has a queen size bed and a full size futon bed/sofa (all in the same sleeping area). Enjoy sleeping to the sound of Four Mile Creek right outside the windows. The Garden log cabin is located between the big red barn and Four Mile Creek, with several perennial gardens nearby. A gas (free standing) fireplace, full kitchen, full bath and 2 queen sized beds, (all in the same sleeping area), make this cabin a cozy retreat. 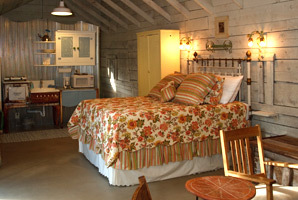 The barn suite was originally the milking room of our historic red barn. A queen sized bed, full bath with a claw foot tub, full kitchen and a gas (free standing) fireplace make the Barn Suite a unique and pleasing country getaway. Located in the main house we offer a classic bed and breakfast room. The Blackbird Room is named for the wrought iron blackbirds that perch on the queen size bed. It is furnished to give a hint of early Colorado's boom times. The convenient bath is located at the end of a very short private hallway. $140 per night for up to 2 guests. Four Mile Creek Bed and Breakfast is located in a quiet valley just south of Glenwood Springs, Colorado. Originally homesteaded in 1885, Four Mile Ranch is listed on the National Registry of Historic Places. 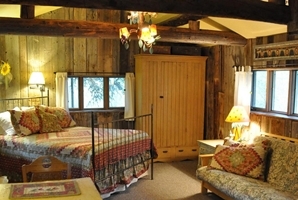 There are two log cabins, a suite in the barn and a bedroom in the main house available for guests. The grounds offer pleasant strolls and relaxing sitting areas. As you approach Four Mile Creek Bed & Breakfast, a large red barn built about 1915 will capture your attention. Sunlight Mountain Resort Ski Area is just a short drive up the valley and offers great skiing as well as beautiful hiking in the warmer seasons.